Find professional Ramsey driveway drainage services when you call us today at (201) 327-5258. We will visit your property to assess the situation and provide you with a free estimate. Click here if you’d like access to our list of current specials and coupons. For most homeowners, the driveway is just the strip of asphalt in front of their house that you park your car on, and although you don’t give the concept of drainage a second thought, you’d notice if the driveway wasn’t constructed with drainage in mind. Proper drainage is one of the most important elements of any driveway, and if it isn’t done properly, the results are painfully obvious. Want to know what your neighbors have been saying about our range of services? Click here to read online reviews! If your driveway isn’t constructed with drainage in mind, you’re in for a host of different issues that will require a new contractor to come in and fix the problem. Placement and slope are the two most important factors in driveway drainage. If these elements aren’t done right, you may end up with standing water in your driveway every time it rains, your garage might get flooded or water can seep into your basement. When water begins to infiltrate your living space, you’re looking at rotting wood, mold growth and extensive property damage. As long as the driveway slopes away from the house at the proper angle and isn’t at the low point of the property, you should be fine. Do You Need Driveway Drains? Sometimes, the driveway is below the street level and there’s nothing you can do to change it, but you can have driveway drains installed to help the situation. 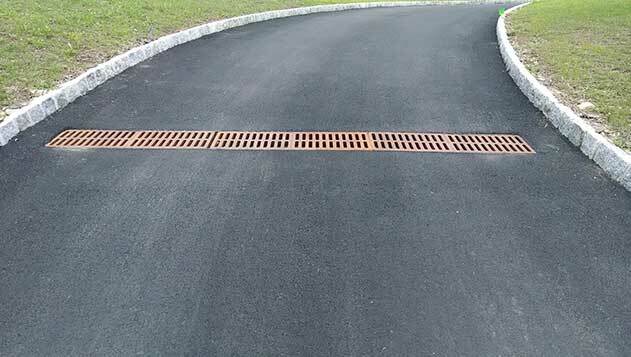 Trench drains covered by grates that run the width of the driveway will help guide water away from the driveway to the street. You can also have smaller drains installed in spots of the driveway that water tends to collect. The prospect of having rainwater end up in your home or garage just because the driveway wasn’t constructed properly is frightening, so make sure you have the project done right the first time. Find a local, reputable company that has experience with driveway paving to take care of it for you. With a local company, you have the benefit of being able to drive past samples of their work to help you make your decision. If your driveway hasn’t been draining the way it should after each rainfall, or if you’re having a new driveway built and need help with drainage, call (201) 327-5258 in Ramsey, NJ and let McFarlane Asphalt give you the answers you need.